This is Jim Huntington’s latest sculpture. He installed it on September 18th at the Huntington Sculpture Foundation. 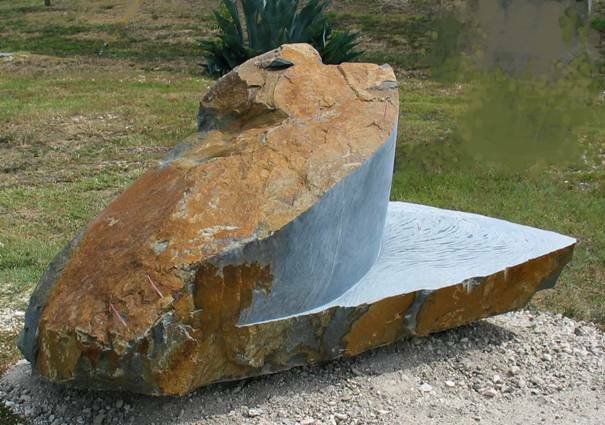 He calls it “Foot Lip.” It is made of granite and measures 36” X 40” X 82”. I asked Jim a few questions about it. Those questions and his responses follow. Stewart: Tell me a little bit about this piece. Where did the granite originate? Jim: Quarry @ Ausable Forks, NY. It’s called mountain green granite. Right now, it is my exclusive quarry, since the supply of granite in America is getting tighter by the year, for various reasons beyond my control. Stewart: What was your inspiration for it? Jim: God ….for everything, a blanket muse and grantor. Meaning, I have always felt that I am merely a messenger and God chose me to play on the art team as Neolithic chiseler. Stewart: What was the process of creating it? Did you encounter any unusual circumstances and, if so, how did you deal with it? Jim: Diamond is the secret to working granite; using diamond, the hardest stone to cut a hard stone. The stone had a lot of faults and seams and I repaired them with copper butterfly “bandages”, epoxied in place and the stone is now weather proof for TX because the freeze/thaw cycle is negligible. The Huntington Sculpture Foundation is open every day and all sculptures are available for purchase. You don’t have to buy anything but if you enjoy this special place, drop a few bucks in the box and sign the guest book. Now that cooler weather is here, I suggest taking a lawn chair and a good book and just soak in the good vibes. Kids love it too but watch out for art-loving wasps. This entry was posted in WHAT is That?, What's New? and tagged Huntington Sculpture Foundation, Jim Huntington on September 25, 2013 by Stewart Dale Spencer. 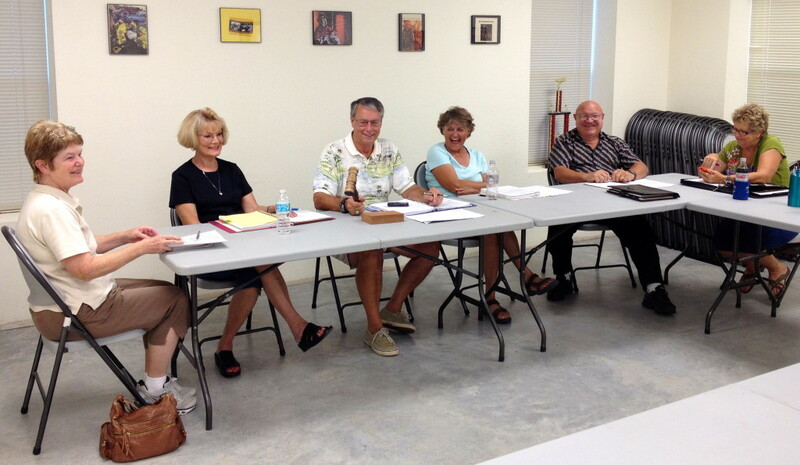 The City Council met in a special meeting on Sunday, September 22. 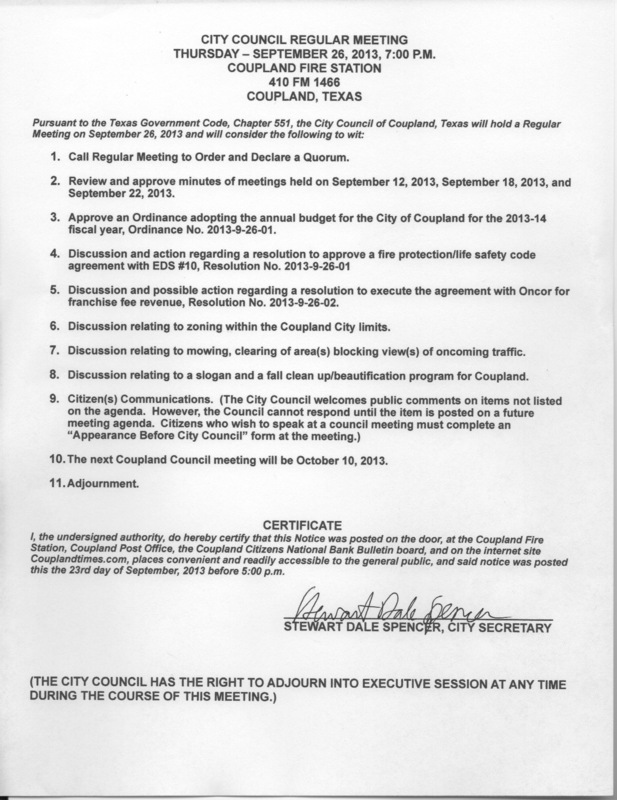 The only action item on the agenda was “discussion, reading, and action” on a subdivision ordinance. Five citizens attended the meeting, which was a new record. Two citizens signed up to address the council. Mayor Piper moved that agenda item ahead of the subdivision ordinance item to allow those persons to address the council before they considered the ordinance. Max Marosko spoke against the adoption of the subdivision ordinance. It was his opinion that there were flaws in the ordinance and that more time was needed to address those flaws before the ordinance was adopted. He said the existing county ordinances and regulations could be adopted in the meantime. Becky Sutton spoke next and thanked the Council for their work on the subdivision ordinance. She spoke about problems in the past with a manufactured home community near Pflugerville. She attributed those problems to the lack of an ordinance in existence at the time that community was established. After this, the City Council discussion on the ordinance began. Mayor Piper spoke about the work that had been done on the ordinance by the Concerned Citizens Committee prior to the establishment of the City Council. He said there was not much difference between that ordinance and the one before the Council. Karen Marosko passionately addressed some of the things that she considered to be flaws in the ordinance. She was especially concerned that the ordinance was applicable to all parts of Copeland, not just the areas outside of the immediate town. Ms. Marosko was part of the Concerned Citizens Committee but said that she had not noticed that aspect of the ordinance before. She was also concerned that the ordinance made reference to a City Master Plan that was not yet in existence. Ms. Marosko wanted to know why there was such a rush to enact this subdivision ordinance. Mayor Piper said that there had not been a rush up until now but that there was credible information that a developer was considering the establishment of a manufactured home community within Coupland city limits. He noted that work had been done on a draft subdivision ordinance for several months prior to the establishment of the City Council. He noted that even though it was not required, public meeting notices were posted and all citizens were invited to participate. [Publisher’s Note: The meetings were also advertised via the community email network. A variety of citizens attended the meetings.] He advocated putting this ordinance in place now to protect the community and then addressing any flaws that might exist via an amendment process. Susan Garry said that the city attorney had expressed his concern as well and advised the City Council to get something in place quickly and then go back and make revisions as needed. Ms. Garry said, “I feel like we were all elected to keep less desirable developments away from the community as a whole and if we’re going to have a new neighborhood, to try to have a nice neighborhood rather than the one like Becky was talking about.” She said that the Richland area was not incorporated and that they had even hired an attorney to try to do something about it but that they had no power. She said that we could not count on the county to enforce its own regulations because they are too busy with other issues. She said that the city would be able to effectively focus on such issues. Ms. Garry spoke about an area just over the Travis County line where people could put anything up and that many homes had no septic systems and relied upon open sewers. She said she knew somebody that kept calling the county to report it but that Travis County did nothing about it. She went on to say that preventing things like that was why the community incorporated and that we don’t need to stand by and let something come in that we were trying to prevent. Mr. Tidwell confirmed her statement and said that the subdivision was out on Wolf Lane in Travis County. Mayor Piper said that the Concerned Citizen’s Committee considered shorter, less comprehensive ordinances but that they felt that the ordinance should cover most contingencies and that it could be fine-tuned later according to experience. Finally, Ms. Garry made a motion to vote to adopt the draft ordinance. Ms. Schmidt seconded her motion. Parliamentary procedure required that action be taken upon the motion and since there was no further discussion the ordinance was put to a vote. Voting in favor of adopting the ordinance were Susan Garry, Barbara Piper, Eldridge Tidwell, and Susan Schmidt. Voting against adopting the ordinance was Karen Marosko. About a minute after the meeting was adjourned, an altercation erupted between two of the men attending the meeting, apparently over things that were said after the meeting was adjourned. This reporter stepped in between the two men in an attempt to de-escalate the situation. Since no one else was willing to assist in separating the two men and neither one was walking away from the situation, I decided to let it go. The two men eventually took their dispute outside. This is the second public meeting I have been to where harsh words were exchanged. The other was a recent meeting of the Coupland Water Supply Corporation. Effective consultation is an art and a skill that can and must be learned. I don’t accept that the kind of behavior I witnessed at both of these meetings is indicative of the general attitude of most of my fellow Couplanders. However, it is obvious that long-standing schisms within the community have festered just beneath the surface. If we are to move forward as a united community, those old wounds must be acknowledged and eventually healed. Many times in my life I have experienced first hand just how thin the veneer of civilization can be and I am not exempt from the influence of my more primitive instincts. Therefore, it is not my intention to criticize any specific individuals for their actions . . . or lack of actions, as the case may be. I understand that sometimes people are provoked beyond their limits, that sometimes people get what they deserve, that sometimes a man’s gotta do what a man’s gotta do, that sometimes you have to fight back, that everyone has the right to defend themselves, and that when faced with an unexpected situation people react in different ways. We should be passionate about the things that are important to us. Nevertheless, I applaud the members of the City Council who, like Susan Garry, spoke calmly and clearly, sharing their opinions and concerns in a level-headed manner. It doesn’t matter whether we agree or disagree. What matters is that everyone be heard and that wise counsel be given due consideration. Sometimes, what is right is clear. Sometimes, even though we may be in the right, wisdom dictates another approach. In the end, if we are going to govern ourselves, we must first govern our baser emotions. I am loth to close. We are not enemies, but friends. We must not be enemies. Though passion may have strained, it must not break our bonds of affection. The mystic chords of memory, stre[t]ching from every battle-field, and patriot grave, to every living heart and hearthstone, all over this broad land, will yet swell the chorus of the Union, when again touched, as surely they will be, by the better angels of our nature. This entry was posted in Local Government, Opinion & Commentary, What's New? and tagged city council meeting, City of Coupland Texas, violence at city council meeting on September 25, 2013 by Stewart Dale Spencer. 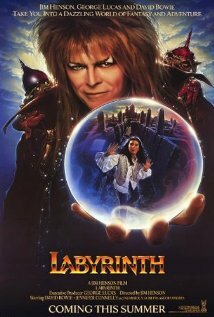 This was the last feature film directed by Jim Henson before his death in 1990. Click here for the IMDB listing and here for the Wikipedia article. Showtime is Monday night at 8:30 PM and admission is FREE! Keep the suggestions coming. See you at The Howard! This entry was posted in Entertainment, What's New? 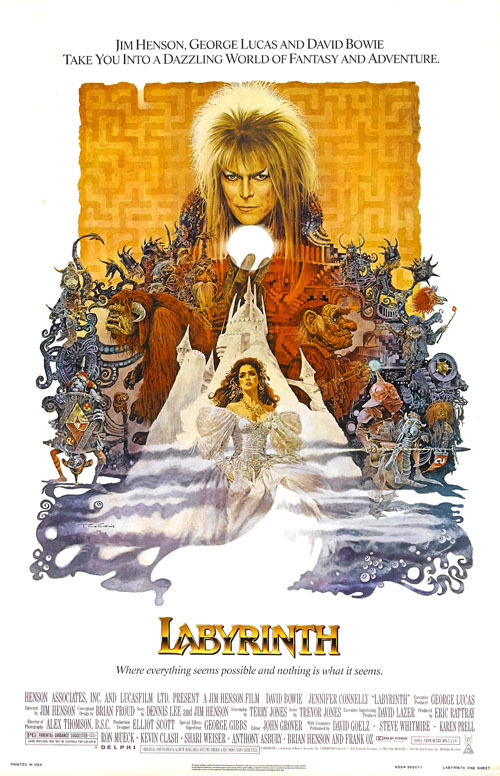 and tagged Howard Theatre, Jim Henson, Labyrinth on September 22, 2013 by Stewart Dale Spencer. I posted this story earlier today . . . or at least I tried to post it from my mobile device because I did not have access to a computer. It didn’t come out right and since then I learned more about this cat. It appeared at our house on the northern side of Coupland yesterday. It looks to be less than a year old. It turns out that it followed our neighbors home and they have posted flyers looking for the owner. If no one claims it, they will adopt it and take it to the vet for a check up and shots. Submit a comment to this article if you know where it belongs and I’ll pass the information along. 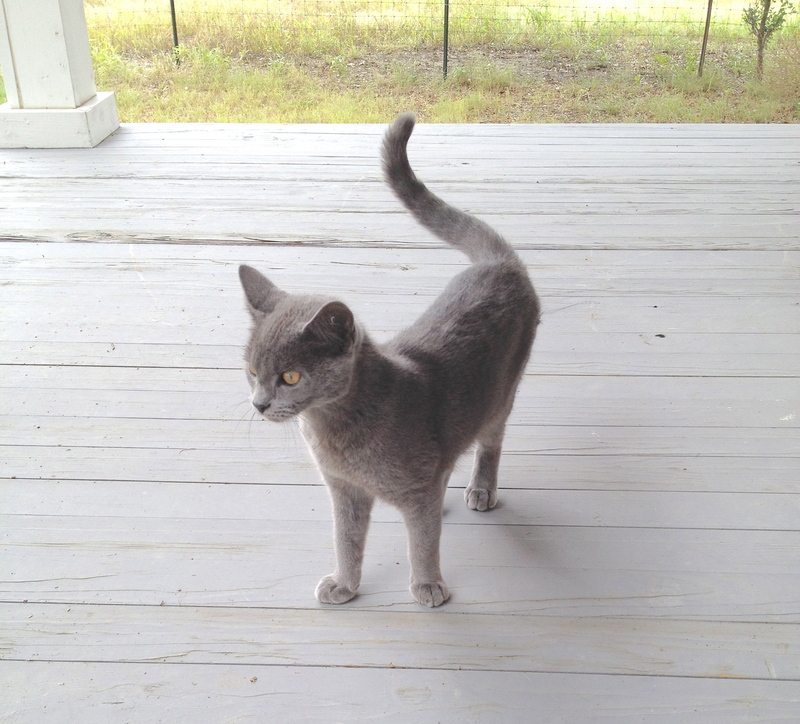 This entry was posted in Lost Pets and tagged Coupland Texas, found cat on September 21, 2013 by Stewart Dale Spencer. September 20, 2013 (Williamson County, TX) – – County Judge Dan A. Gattis lifted the burn ban for unincorporated areas of Williamson County today, Friday, September 20, 2013. Even though the burn ban has been lifted, no outdoor burning of combustible materials will be allowed during Critical Fire Danger Days and Red Flag Warning Days. To view the current fire danger status, go to the Texas Forest Service website and click on Fire Danger/Drought. Please be cautious with any outdoor burning activity. Outdoor burning must be conducted under state regulations found in Texas Administrative Code Section 30 TAC 111.219. Please contact your local fire department – Some fire departments may require a Burn Permit. Please contact Williamson County Communications – Please call and report your control burn to Williamson County Communications at (512) 943-1389. Williamson County Communications should be able to inform you of any burning restrictions that Williamson County Communications has been made aware of and that may exist. This entry was posted in Local Government, What's New? and tagged burn ban lifted, Williamson County on September 20, 2013 by Stewart Dale Spencer.